Love the sectional where is it from? - I love the sectional. Love the picture above the couch. Where did you purchase it? Hi Louise, it's actually a commissioned piece by a wonderful artist, Tahiti Pehrson. Not sure if you're in the New York area, but he had a show opening this evening if you'd like to see his work in person! Where can I get the gold bowls? The color red reveals Vineet's vitality and passion; this red wall serves as his awards wall. "This is a subtle alternative to hanging up his PhD diploma and other accomplishments," Loczi says.Loczi introduced Vineet to the work of local artists, including Tahiti Pehrson, who created this 4- by 10-foot cut paper piece. The artwork connects to the other geometric pieces in the room and balances the size and color of the awards wall. Room designer: LoczidesignThis is a strong interpretation of the movie shot’s palette. 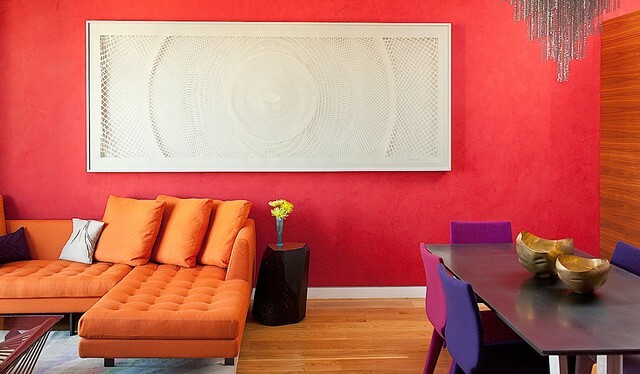 Here, the colors — coral, as well as plum and an indigo-purple — vibrate with energy, though their intensity comes from the colors themselves rather than from the glow of an electric light. love the colors of these dining chairs.